Highway 101 is called the Pan-America Highway because it runs all the way from Canada down to the tip of South America. Our nearby community of Lund boasts that it is the end (or beginning) of this lengthy intercontinental thruway. But within the limits of Powell River, BC, it's better known as Marine Avenue. 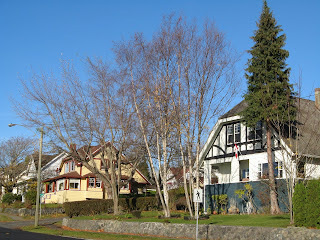 Marine Avenue starts in Westview and ends in the Historic Townsite. There's a lot of history along this roadway. When the Townsite was created for the workers at the papermill in 1910, it was known as Oceanview. In 1959, the name was changed to Marine Avenue. On the east side there's Manager's Row. These large homes originally housed the papermill's most important employees. Perched above the Strait of Georgia, they had a birds-eye view of the ocean and mill below. As Powell River's population grew, people moved to homestead land north and south of the company owned town. The community that grew to the south was called Westview. The "main drag" became Marine Avenue. 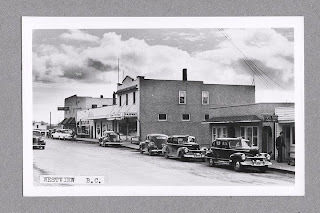 Today you can still see many of the old buildings preserved as stores, restaurants and homes. Thanks to "You Know You Grew Up in Powell River" for sharing this historic picture on Facebook. 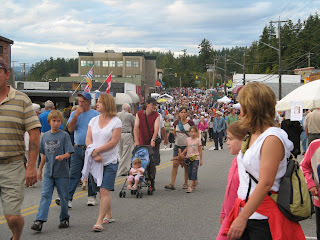 Today Marine Avenue is an important part of life in Powell River. It's the location of important events such as the Blackberry Street Party and the Santa Claus Parade. It's also the home of Powell River Books. may be one day, I will drive from Canada to South America. I went to university in Canada. Lund looks and sounds like a fine historic town Margy. It nust be quite special being as you say, the beginning or the emnd of a very long journey.